A box of old CD-ROMS could be tossed. But because some environmentally conscious person dropped them off at Detroit’s Recycle Here center, a dozen Detroit youth transformed the would-be landfill waste into colorful suncatchers. Splattering a disc with paint, Yaasameen Watkins, 12, was delighted to “help the environment” and proudly shared that her mother recycles cans. Fellow campers painting outside suggested other materials she could recycle. “Paper!” shouted 9-year-old Aureianna Montgomery. “Aluminum,” added 8-year-old Brooklyn Jones. Green Living Science’s free Earth Camp was accomplishing its goal to teach Detroiters, ages 8-13, about the three Rs: reduce, reuse, recycle. Besides suncatchers, the kids spent a recent morning making paper from recycled scraps, pin wheels from file folder dividers and magnets from old computer keys. Folding newspapers into a monster-shaped bookmark, Candace Montgomery, 13, underscored why it’s important to recycle. “With all the environmental problems we have now, instead of contributing to them, we can at least just help lessen it a little bit,” she said. 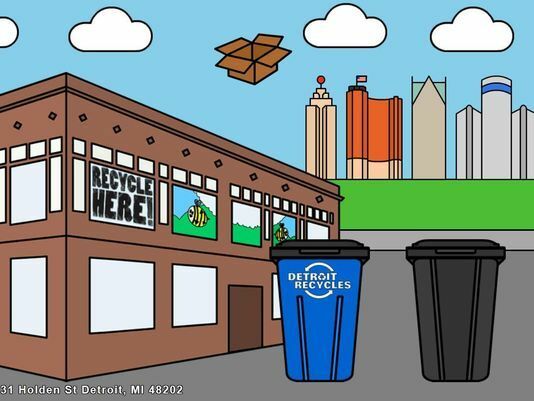 The nonprofit Green Living Science and coalition Zero Waste Detroit have worked with the city, encouraging Detroiters to recycle since a pilot program launched in 2015. At the time, less than 10 percent of residents were recycling. As of June, 21 percent, or 44,381 residential households, have a recycling cart, either by purchasing it for $25 or receiving one for free at a Green Living Science or Zero Waste Detroit workshop. An effective way to boost the recycle rate is to target kids, said Rachel Klegon, executive director of Green Living Science, which hosts school assemblies about the three Rs. If students fill out a recycling questionnaire with their parents, then bring it back to school, families can get a free recycling cart. “I often hear parents say, they’ve never thought about recycling, but their kid learned about it at school, and now they’re here (at Recycle Here) — kind of saying it complaining to me, but with a smile,” Klegon said. For the first time in 2014, city contracts required waste hauling services to offer curbside recycling for household residents (apartment dwellers were excluded). The opt-in service was a gamechanger for Green Living Science, which sometimes hesitated to do outreach at schools. “We didn’t want to teach kids that you should recycle, but you can’t do it because your family is unable to drive to Recycle Here,” said Klegon, referencing the drop-off center established at 1331 Holden in 2005. Now, the challenge is convincing Detroiters a recycling cart is worth $25. “We’re in a city where a lot of people have not recycled before, so they don’t know why they should pay that $25,” Klegon said. Residents who can’t afford it can go to the city’s website to play an educational recycling game, where players drag materials such as cardboard, magazines or Better Made Potato Chip bags into a trash or recycling bin. After, players can sign up for a free cart. Margaret Weber, convener of Zero Waste Detroit, said the city has been “very slow” to inform residents how to access carts and properly recycle. “We’ve been told for a couple years there would be a media campaign, and to be very honest, we’re still waiting for that media campaign,” said Weber, adding other cities with higher recycling rates have invested in messaging. The city did achieve its goal of a 20 percent recycle rate by this August. The next target is 30 percent by August 2018. Yet Weber pointed out that tonnage collected is still low. For example, about 339 tons, or 16 pounds per household, was collected in May. Which is why Green Living Science is teaching youth to pause before tossing a pop bottle. As Anthony Dent, 9, folded a file into a pinwheel, he admitted his family doesn’t recycle. But that might change.